Swath or straight combine frosted canola? Within a day after the frost, pedicels — the small stems attaching pods to stems — are drying out and snapping. Pod splitting or pod drop due to tissue damage from the heavy frost usually starts within a day of the frost event. If the canola crop is still sound, growers can probably stick with original plan — whether that was to straight combine or swath. Note that if swathing, an extra few days standing in these good conditions will probably help fill seeds and increase overall plant maturity, as long as those plants are still alive. If the frost has killed them, then waiting to swath probably won’t help. If you decide to swath frost-stalled fields, now is probably better than later given that plants will be brittle and will just get worse. Getting them down into a swath could protect these brittle plants from wind whipping, which could increase losses in standing canola. However, swathing means you handle these brittle crops twice. The act of swathing may create just as many losses as leaving the field standing. —Would you sleep better if the crop was swathed? If yes, swathing is probably the best decision. —What is the state of seed in the most frost damaged pods? If frost hit top immature seeds hardest, these will shrivel up and won’t contribute much to yield anyway. 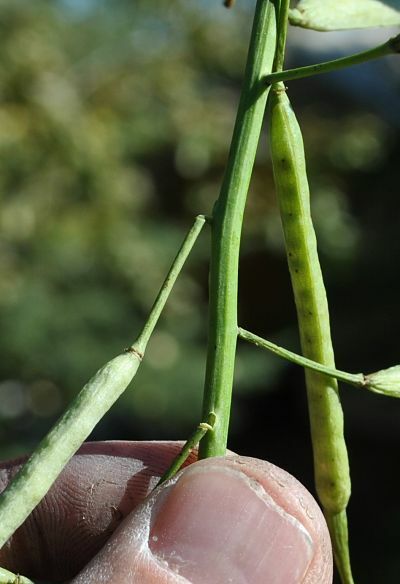 If frost damage was minimal to those lower pods that will contribute more to yield, you may be able to leave the crop standing — if that was your original plan — without significant losses to these pods. —Will pod shatter tolerant varieties reduce pod shatter after a frost? We don’t have data on this but it may be worth a conversation with the seed provider. If you’re still torn, swath part of the field, leave the rest, and do a comparison. That experience might help the next time you encounter this situation.